The Tempo 9 is a performance trainer with underfoot support features focused on stabilizing the foot from mid foot to forefoot. I would call the Tempo a "serious shoe" for fast comfortable well supported training. I did not run in the Tempo 8 but have the Boston 6, adios Boost 3, and Energy Boost (4), review soon. The Tempo 9 is not a traditional posted pronation support shoe where the focus is on stabilizing the foot in the early part of the gait with most commonly a firm "post" of foam on the medial side nearer the heel. I absolutely can't stand traditional stability shoes with such a construction. 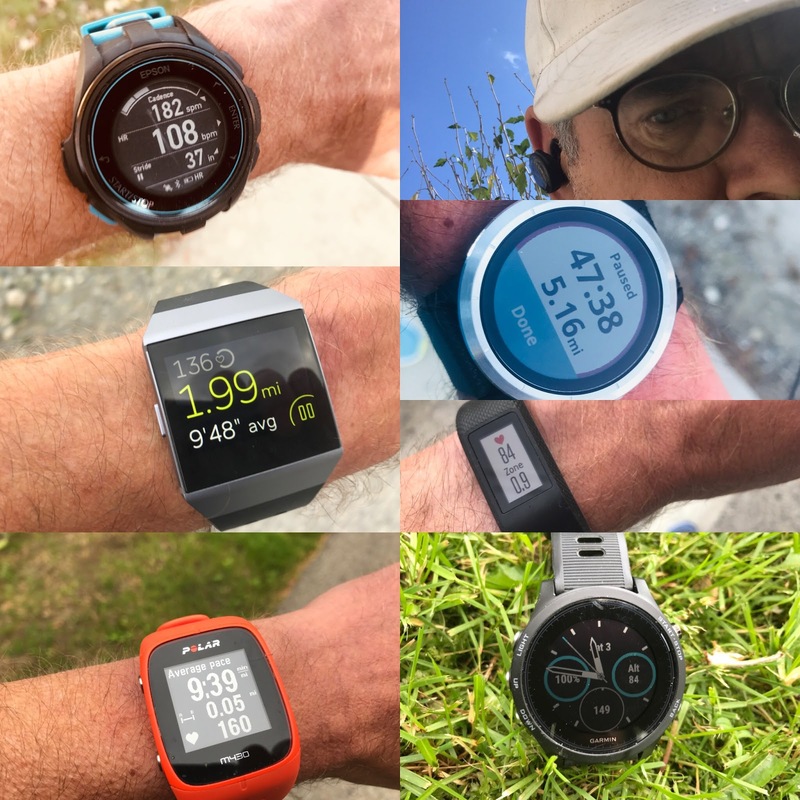 Tempo on the other hand represents a great blend of features for any runner who seeks protection, a touch of forefoot stability, and responsive cushioning for their uptempo running or daily training. It reminds me a lot of the excellent Altra Impulse with similar mid to forefoot stability features and my 2015 shoe of the year, review here. Looking at the lateral side above everything looks much like a neutral shoe. Neutral runners, and I am one, should not be scared away from the Tempo if you seek a stable fore to mid foot platform and a more responsive and stable ride than say the Boston. The main stability action is over on the medial side, see below. The Tempo 9 represents a next evolution of adidas Boost technology. 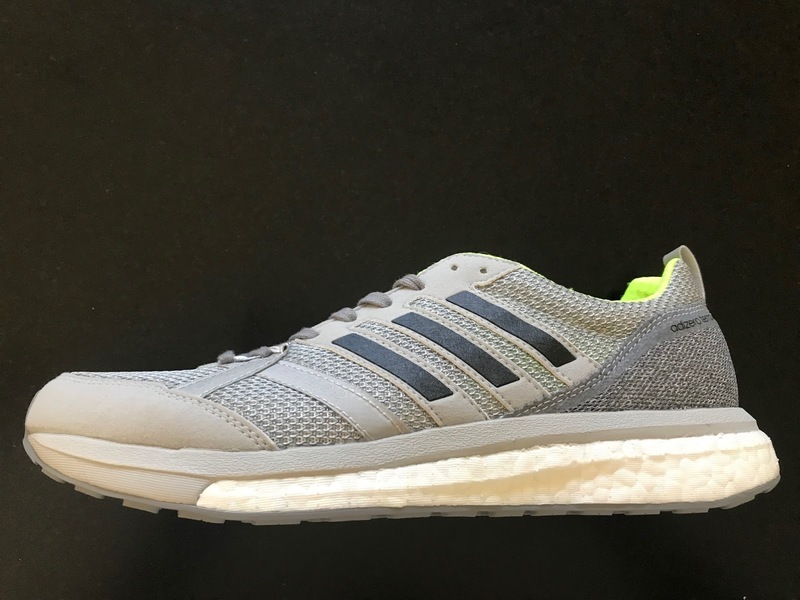 Boost, a TPU based midsole with springy rebound has found its way into many adidas performance running and lifestyle shoes. Boost midsoles alone are soft and hard to tame. In the Tempo adidas for the first time uses a dual density Boost, with firmer material under the arch. It's called "Energized Stability". It is present and felt but not overly intrusive. It represents as far a I know the first example of a dual density Boost midsole. 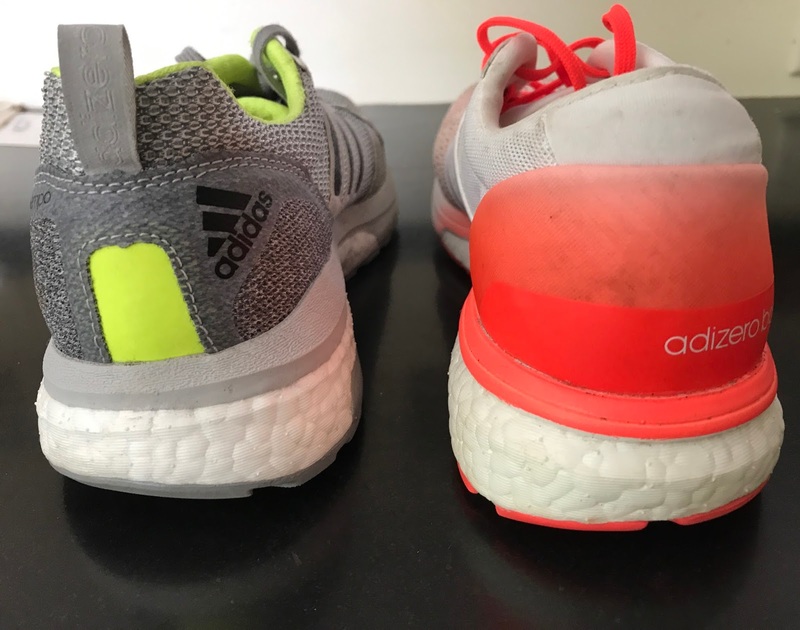 the medial side Torsion plastic plate on the outside of the midsole at the heel also found in the racing adios Boost and Energy Boost (review soon) but not in the Boston, a key feature for me to stabilize the soft Boost at the heel in any Boost shoe. The EVA dips down earlier than the Boston on the medial side and at 60% Boost content is considerably less Boost than the 85% in the soft Energy Boost, less Boost a good thing for me. fuller coverage of flat outsole lugs under mid foot than Boston and not a Stretch Web rounded and soft approach such as on Energy Boost. While all this does add up to some added weight it also make the Tempos a more suitable more supportive daily up tempo trainer than the Boston with more forefoot cushioning than the adios and certainly a more fun to run and responsive shoe than the next adidas model up, the considerably heavier and bouncier Energy Boost 4 (review soon). The Tempo 9 fit me true to size with plenty of room. 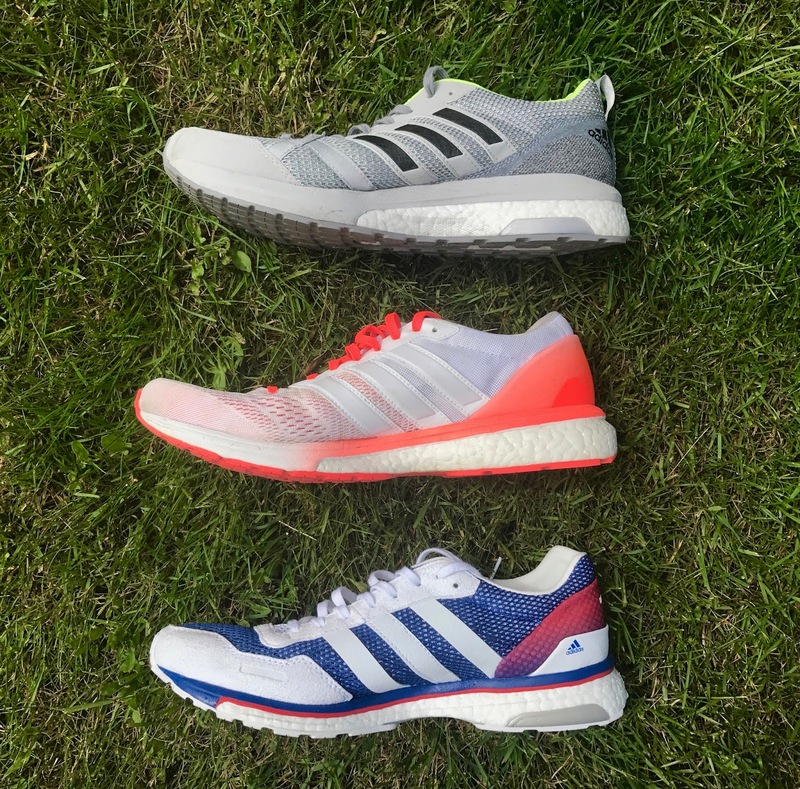 I was half size up in the Boston 6, true to size in the adios Boost 3 and true to size in the new Energy Boost 4. The upper is comfortable soft mesh and is wider fitting than Boston over the metatarsals due to the new adizero Webbing. The webbing opens up the area over the metatarsals and helps the upper flex with the shoe. It is on the narrower side up way up front. 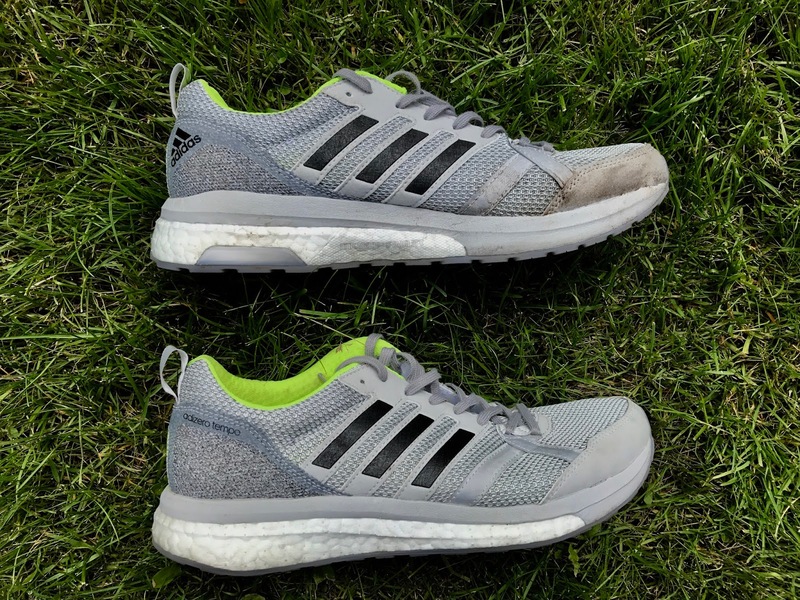 Care must be exercised to make sure they are laced snugly as the mid saddle soft suede adidas 3 Stripes is not that substantial in thickness, even less substantial than the either the Boston or even the adios Boost. 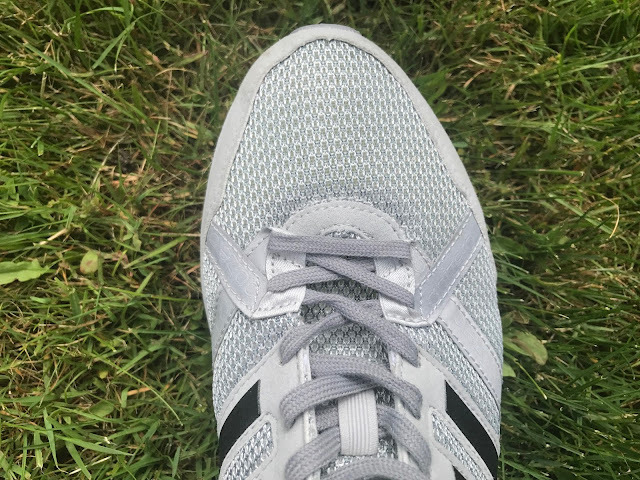 When combined with the open flexing area around the last lace up due to the adizero Webbing, I have had my foot slide forward to touch the front if they are not properly and relatively snuggly laced. Rare that an adidas can be called relatively unstructured as this upper given adi's fondness for plastic stripes and "cages". I think they went a little to far here, even the plastic strips of the Boston at the saddle would help hold the foot better in combination with the open adizero Webbing at the metatarsals. The heel collar is lightly padded. Tongue is similarly padded to the Boston but is not the slick fabric of the Boston so I have noticed less tongue slip side to side. The pointy very front of the shoe is clearly noticeable in the photo above. A slightly more rounded front toe box in combination with a more substantial mid foot saddle would be an improvement although the soft suede toe bumper is accommodating. The Tempo 9 is what I would call a "serious" ride best for stable, secure faster training, sort of like a fine Audi or BMW. Even its understated gray and black says serious business here. It is firmer than the Boston and even the adios Boost per mm of stack, understanding the adios is of course lower by 3mm front and back due to the Tempo's thicker EVA layer and this I like. The ride is more stable from heel to toe, and firmer than other performance Boost shoes such as the Boston. It is firmer than the Energy Boost and more forgiving especially under the forefoot than the racer adios Boost. Shock is well cushioned without being mushy. Strangely the upper does have a relatively unstructured foot hold that could use a bit more of the support and security at mid foot to lock my foot down and away from the narrow tip of the shoe. I have run slow and fast in the Tempo and it is adept at and suitable for any pace. This is not a natural underfoot ride where maintaining good form is required to stay on track. I felt less sloppy on longer runs as I tired than in most shoes and more directed and in the path of travel at faster tempos. It could easily be a better marathon shoe for me than the Boston, if I can lace them securely. This said, for sure, I lean towards the adios for half marathons on flatter course. It is clearly less agile than the adios Boost and heavier but also is more versatile than the Boston or Energy Boost. Recommended for neutral runners in need of a bit of stability and mild over pronators. -0.1 for weight, the outsole could be trimmed down under midfoot, at least for me the denser Boost is not necessary and the EVA maybe made a bit thinner. While I very much enjoyed the Boston it's thinner EVA layer and lack of both the medial rear Torsion plate on the midsole and longer front Torsion medial plate makes it to soft and unstable in comparison to the Tempo 9 for me as a trainer and potentially as a marathon shoe. I would give the forefoot and mid foot stability Impulse a slight nod as it is lighter and more agile for shorter distance racing, up to a half, over the Tempo. I am fine with Altra's Zero Drop, but not day in day out or for a marathon, so for versatility the Tempo gets the nod. The Tempo was provided at no cost. The opinions herein are entirely the author's. How do tempo and Boston compare in the forefoot area(in cushioning/stiffness/performance)? Which one has soft forefoot,would u suggest for slower, 5k runs? Boston is more flexible, softer in forefoot than Tempo. It is less stable there and overall. For slower 5K runs and I assume you mean training and not raising and if you do not need or want any stability features I would say Boston. For longer runs at faster paces day in day out Tempo 9 especially if you need stability features. What are you running in now and how do you like them? Can tempo be used for hard soil (free of any debris, rocks) trails for 4-5 miles medium paced runs ? As noted, I found the toe box way too narrow. I'm a size 11. Wonder if I should bother trying an 11.5? Or is it true to size. It is a narrow toe box. I would guess your foot would still be well held in an 11.5 but not sure the width would be improved much as the mesh doesn't have much stretch. How did your half go? Brooklyn Half was a blast although I started out too hard as often happens even with a plan. I've been using Stryd and running with power. The power number I chose was too high and by mile 8, I was feeling it. The end is always a blast on Coney Island. In total, a great race! Used the Ravenna 9's and held up great. 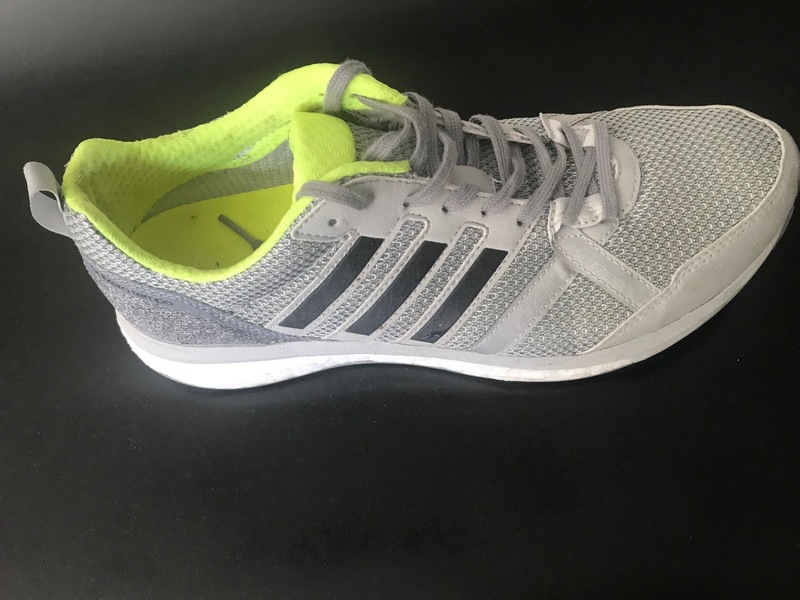 For fast tempo 5k, 10k, 21k, 42k races what would you advise Adidas Adios 3 or Adidas Tempo 9? That is a wide range of distances. What are your race goals? If you think you need some stability then Tempo 9. It would also be a more supportive shoe for faster training and longer races. For racing 5K to Half adios for sure. Beyond half depending Boston 6 or 7 or Tempo unless you feel the adios Boost has the cushion and support you need. Reviews of all at the link below. I own a Nike Pegasus 34 (US11.5, EUR45.5)(perfect size) and a Mizuno WaveRider 21 GTX (US11.5, EUR45)(slightly on a larger side). Both are beyond 500k and it is time to think about new shoes, something fast. I usually land on the ball of the foot and train in the range from 4min/km to 5min/km and a little bit in the range from 3:30min/km to 4min/km. I would prefer to find something that is faster than what I own at the moment (it doesn't have to be Adidas). Also it would be good if I were able to use them sock free because of triathlons. I tried Adidas AdiZero Tempo 9 in a shop (US11.5, EUR46) and they felt a bit small in the toebox. I find it quite strange. Not sure if I will have to go with US12 (EUR46+2/3). What was your experience with sizing of Adidas AdiZero Tempo 9 and Adidas AdiZero Adios 3? I am not sure if I need the added support. I do occasional have a problem with one bad knee. Is it bad to use trainers with support if you do not overpronate? So we are pretty close in race times. Tempo 9 no question has a small toe box and for me too. Have you looked at Boston 6 or 7? Still on the snug side but a better fitting upper up front than Tempo. It is a faster shoe than your others. Others to look at of course Peg Turbo but also Saucony Kinvara 9 which I think you could wear sockless, Salomon Sonic RA or RA Pro, not as sure about sockless for those, Asics RoadHawk FF 2, New Balance Fresh Foam Beacon. All of these except Sonic RA lean more towards performance than trainer. Neither of your existing shoes are pronation control per say but stable. 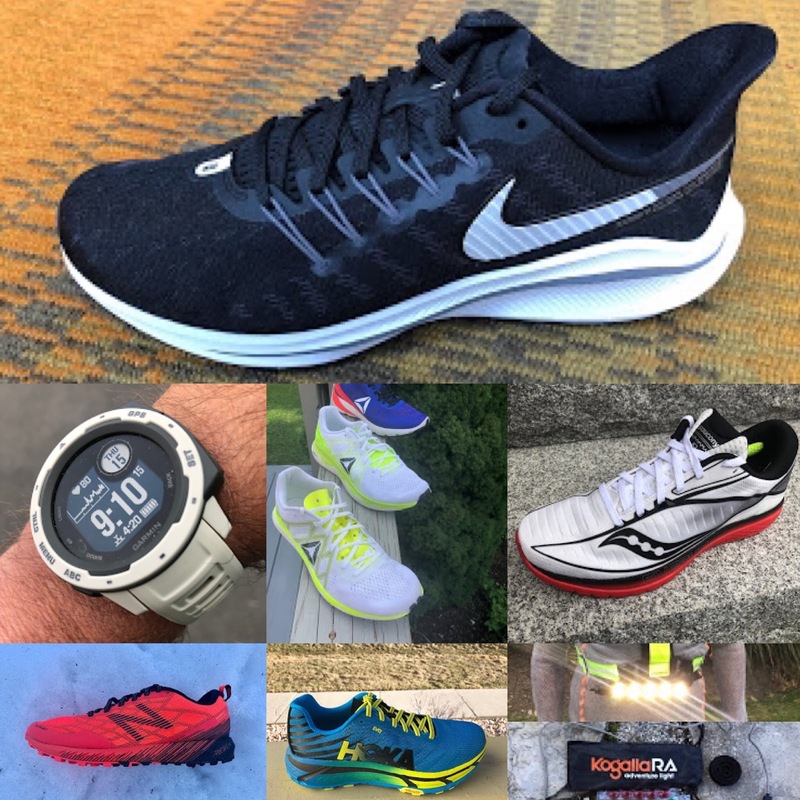 If you want to keep some stability of the shoes above the Sonic RA would have the most followed by Kinvara 9 but less of a sense it is there than Tempo 9. See reviews of all at the index page below. I found Kinvara 9 in a local store and plan to try them out this weekend. I saw there is some concern about their longevity. How big is this issue. Also I see they have only 4mm heel offset, and I am used to 10mm. Might this be a problem? Hi Sam. Any news on a Tempo 10?